specific concepts on the Akashic Records systems very new to me and so difficult to appreciate. For example there are five pillars of light consisting of Incarnation, Authority, Discipline, Responsibility and Commitment. Without a graphic, I found it hard to visualize where this in my body and how long they are and exactly where they are positioned. There was a written description, and I understand the concepts but the actual simulation of light around the body in a star formation is difficult for me to conceptualize without a drawing of the body. I would have preferred if the book came with a diagram or sketch. Further to that, there is the triangle of heart, mind and will. It is located somewhere in the body. The closest I got to its location is that the heart is found in the heart chakra and the mind is found in the top head chakra. The will is then found at the throat chakra. All of this makes sense, but in my mind, I do not see how it creates a triangle that is supposed to be equilateral and balanced. Again, a diagram would have been nice to visualize the concept better. I understand that the central pillar of light is grace composed of compassion and related components. I understand visually that it is the central pillar of light running through our bodies. I understand it is divine and comes from the source. I can see this one. I understand that the following is a pattern that we should be using to deal with our problems in our lives: acknowledge, appreciate, acceptance and appropriate action. This makes sense as the stepping stones to dealing with present day problems based on the Akashic Records. I understand that the Akashic Records is a system that keeps record of every thought, action or energy we have displayed in previous lifetimes, in the current manifestation or in future lifetimes. I understand that there is an energy grid. I don’t understand how someone like Edgar Cayce (The Sleeping Prophet) could only access the Akashic Records while under a deep state of relaxation and that we can somehow access it ourselves without transcending into a deep altered state of mind as well. I found the questions helpful especially for the group questions. I would recommend that as you read this book, you highlight the Opening Prayer and Closing Prayer. I was using an e-book so it was difficult to go back and forth. (Plus, the Adobe Digital Edition software was not co-operating and would keep messing up which in and of itself was frustrating.) I would recommend typing the opening and closing prayers onto a paper or into a word document. If you have a physical hard copy of the book, you can highlight or dog-ear the page and reference it as needed. I also found the Appendix helpful. There is a better explanation of what state you should be in for the opening prayer in it on pages 165 to 167. 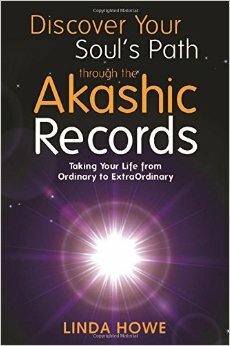 I think it would have been helpful to have read Ms. Howe’s earlier books to get a better idea of the Akashic Records. I think she would have covered some more detail that may have been overlooked or assumed to have been known in this book. Overall, I am a visual person and I would have liked the five pillars of light or consciousness graphed out along with the triangle. Without these concepts down, I feel lost in reading and following the book. The final recommendation I will make regarding this book is that you should audio record the reflections onto your computer or digital device and then play it back to yourself while you are in the process of doing a reflection. This will give you more time to think of being in a higher spiritual realm of thinking and give you time to make the connections with the Masters, Teachers, Loved Ones and the Lords of the Akashic Records. Despite my difficulties with the book and some of my personal frustrations, I would still recommend the book to those who are interested in their spiritual development. Tags: Spiritual Development, Concepts, Five Pillars of Light, Consciousness, triangle, heart, mind, will, grace, heart chakra, head chakra, throat chakra, Akashic Records, Edgar Cayce, The Sleeping Prophet, Masters, Teachers, Loved Ones, Lords of the Akashic Records, Energy, Thought, Action.